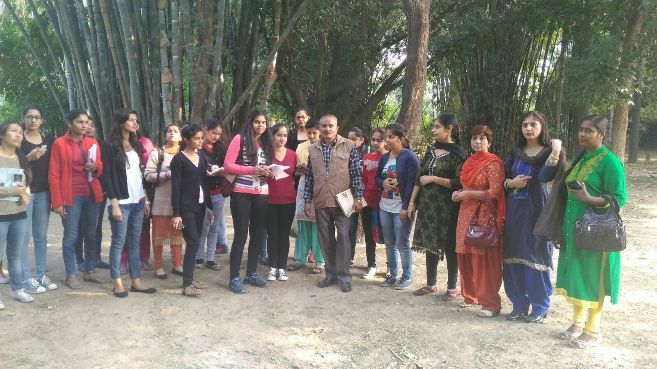 An educational trip to P. U. Botanical garden was organized by Botany of the college on 27.11.2015. Around 40 students of M.Sc. I and M.Sc. II (Botany) were taken for the field trip . The teachers accompanied were Dr. Madhumita Bhattacharjee, Dr. Anurita Sharma, Dr. Harsh Manchanda and Dr. Anju. Mr. Gurudev of P.U. Botany Deptt. guided the students in botanical garden. He made them familiarize with various Gymnosperms and Angiosperms. Some aquatic plants were also seen. The botanical names of the plants , their family and uses were discussed. Mr. Gurudev also emphasized on medicinal value of many common plants. The main attraction of the trip was the “Cactus House “ and “ Fern House “. A number of different varieties of cactus are grown in cactus house. The P. G. Students also visited the Central Instrumentation Centre in Botany Deptt of P.U. They got chance to see many sophisticated and advanced instruments as HPLC , Gas Chromatography and Florescent microscope. All the students enjoyed the trip and gained knowledge about many valuable plants and instruments. Overall the trip was very fruitful and created interest among students to know more about plants.